Johnson literally jumps out of nowhere to make plays. The senior linebacker is able to contort his body, get really low and explode past offensive linemen to make plays in the backfield. 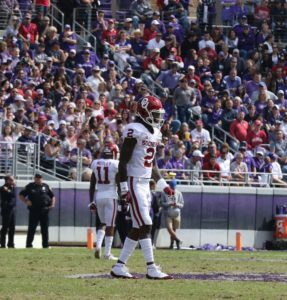 Johnson had a third and goal tackle for loss on the Sooners first possession after he blew past the Sooners linemen to stuff the play in the backfield. Johnson also impressed with his hustle to the football. After Oklahoma receiver CeeDee Lamb caught a curl route and took it 50 yards downfield, Johnson snuck up behind him and poked the ball loose, turning what would’ve been a massive play for Oklahoma into a turnover for Texas. Johnson’s pursuit to the football will catch the eyes of scouts, but he will have to work on shedding blocks once he is engaged. Boyd is a technician at cornerback. His ability to mirror receivers and play off of their motions is NFL-quality. The senior cornerback has had a pass deflection in all but two games this season. 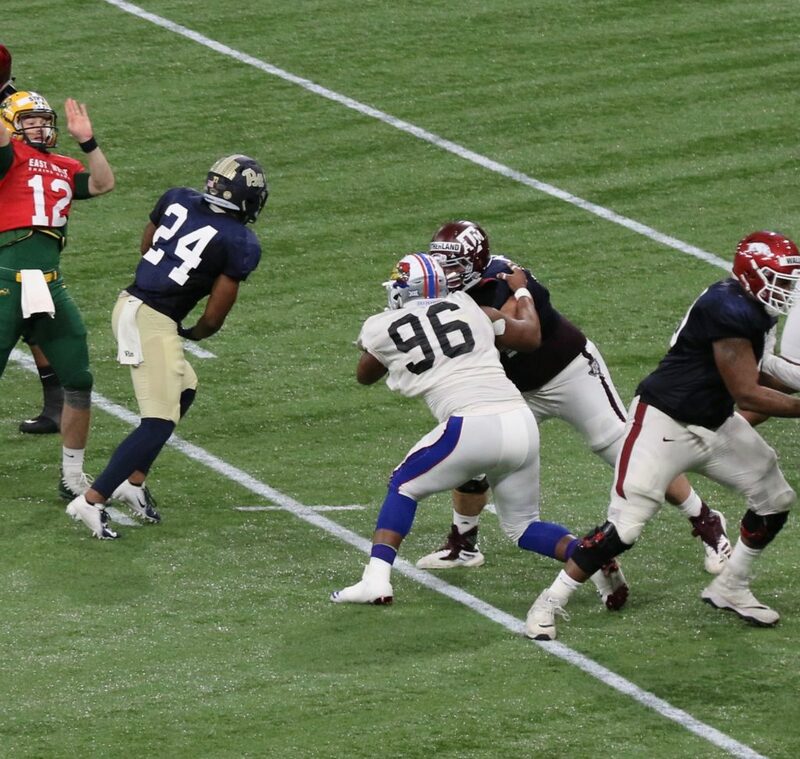 Boyd had another pass deflection when he mirrored Oklahoma’s Marquise Brown on a fade route and then brought his hands through Brown’s hands to knock the ball away at the last second. Boyd is also a willing tackler on the outside. Look for a team, who is looking for man-to-man corners to target Boyd in this year's draft. The Sooners star receiver is a fluid route runner, who also has excellent hands in traffic. Regardless of his slight build, Lamb has shown the willi ngness to extend his body and leave himself susceptible to shots to his ribs. The sophomore receiver can make big plays as a receiving option on screens or he can make plays for others as a lead blocker on bubble screens to other receivers like he did in the first half against Texas. Lamb caught a touchdown over the middle to bring the Sooners within one point of the Longhorns in the second quarter. 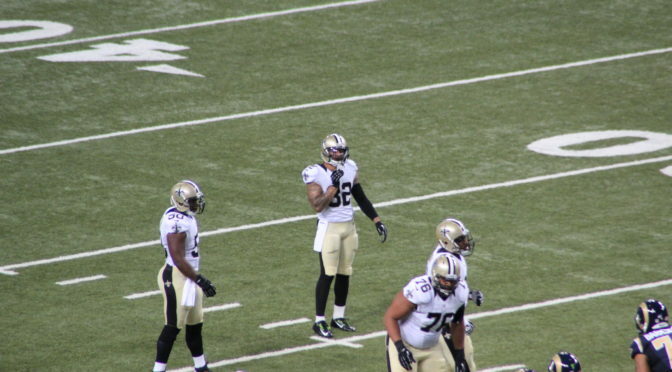 Despite his fumble, Lamb was productive, finishing with six catches for 167 yards and a touchdown. Tom Herman enters his second season as the Longhorns head coach after a 7-6 season in 2017 and a bowl victory against Missouri. The team returns a number of starters from last season and the same can't be said for its Big 12 counterparts, which should make them a candidate to improve in the conference standings. Texas did lose five starters on defense but return three seniors on the defensive line and three seniors in the secondary. At the second level, the Longhorns also have two NFL-caliber linebackers in seniors Breckyn Hager (6'4, 245) and Gary Johnson (6'0, 230). Offensively, the Longhorns are in need of playmakers around junior wide receiver Collin Johnson (6'6, 220). Last season, Johnson caught 54 passes for 765 yards and two touchdowns. 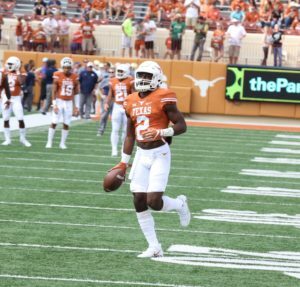 If Texas wants to improve their fortunes offensively, then they will have to settle on the running back position. In 2017, sophomore quarterback Sam Ehlinger led the team in rushing with 385 yards. Defensively, they should be able to compete with anyone, but the team enters the season with question marks offensively. Boyd's performance against West Virginia's leading receiver, David Sills V, was exceptional in 2017. Sills V, who finished the season with 980 receiving yards and 18 touchdowns, caught just two balls for 47 yards against Boyd and the Longhorns. For the season, Boyd had two interceptions and 15 pass deflections en route to being named second team All-Big 12. The senior defensive back will have another year to acclimate himself to second year defensive coordinator's Todd Orlando's scheme and has already been named to the Jim Thorpe and Bronko Nagurski watch lists. What better way to announce the Texas Longhorns are back than with a win against the USC Trojans? 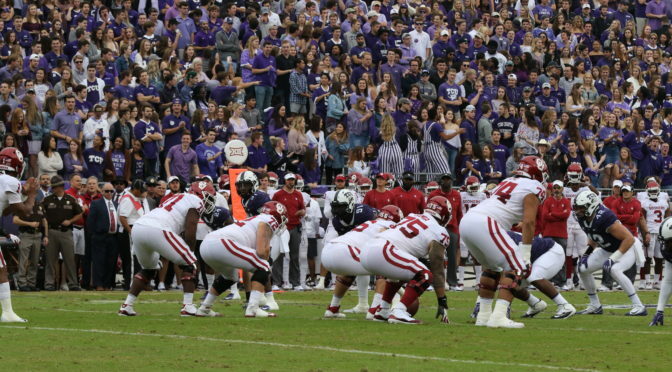 The rematch of the 2006 Rose Bowl will take place in Austin during Week 3 of the season. Both the Longhorns and Trojans are coming off solid seasons after what has largely been a decade of underwhelming results from each team. Last year, the Trojans defeated the Longhorns by a field goal and expect this year's matchup to be just as competitive. Omenihu (No. 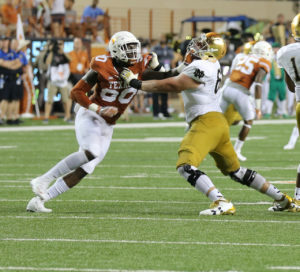 90 pictured) has posted 7.5 sacks, 12.5 tackles for losses and three forced fumbles in his three years as a Longhorn. Omenihu has put together a combined 20 starts over the course of the last two seasons. In 2017, he began to put his talent on display more consistently. Despite requisite length, he hasn't affected the three-step passing game up to this point in his career. His hand usage is a work in progress as a pass rusher. The former Rowlett High School (Tex.) 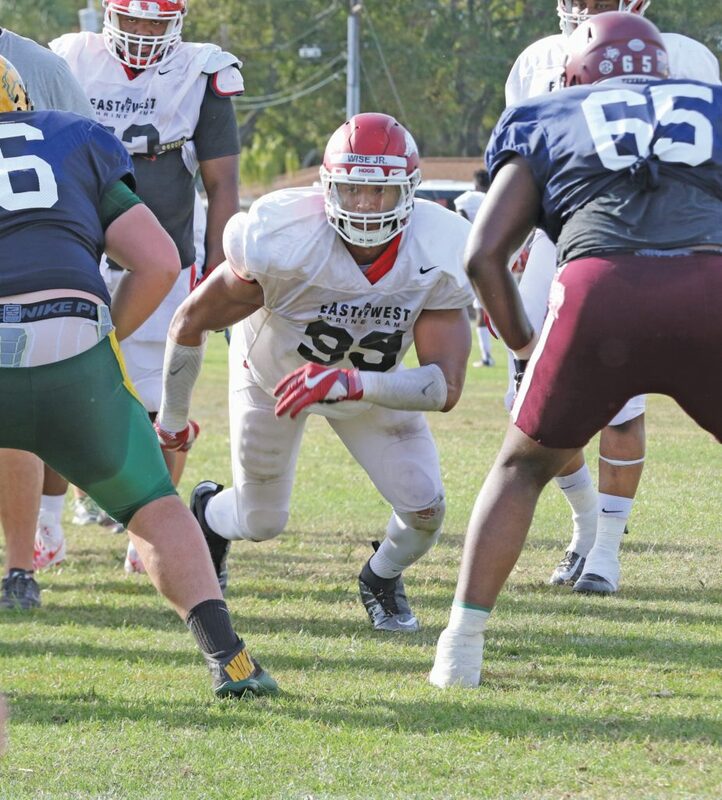 star has a feel for slicing gaps and he can create inside penetration quickly off the snap. For him to become a more dominant defender, he needs to improve at creating separation from offensive linemen. 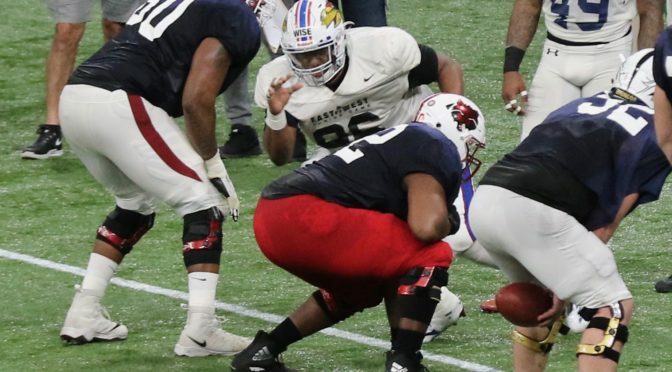 Standing over 6-foot-5 inches, he has some upside as a 30-front defensive end prospect if he can put on an additional 10-to-15 pounds. Draftnasty's Troy Jefferson is predicting the Longhorns will fall to USC and West Virginia at home and on the road against Oklahoma State. However, Texas will win two more games than they did a year ago and, most importantly, defeat rival Oklahoma. Former Texas center Mohamed Bamba brings an underrated game and 7-foot-10-inch wingspan (the longest ever recorded ) to the NBA. 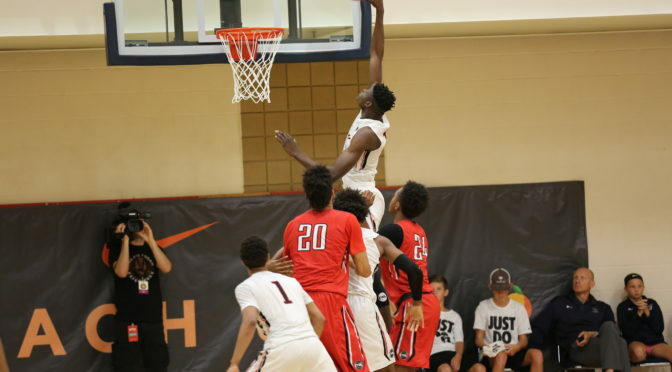 The former Westtown School (Pa.) product stood out for the PSA Cardinals in his matchup with current Kentucky center Nick Richards during the 2016 Nike EBYL Peach Jam. The performance was only a sign of things to come. As a freshman for the Longhorns, Bamba averaged 12.5 points, 10.9 rebounds and finished second in the nation in blocked shots per game (3.7). Along the way, he shot 54.1-percent from the field. We went inside the game of the 2017-18 1st team All-Big 12 defender during our visit to check him in July 2016.